Last week, equity performance resulted mixed after major indices tested a technical support and after US put/call volatility spiked up, testifying a short term surge in risk aversion. The MSCI World index’s total return fell by 0.6% (S&P 500 -1.4%) but the EMU index overperformed at +1.1%. Last week, equity performance resulted mixed after major indices tested a technical support and after US put/call volatility spiked up testifying a short term surge in risk aversion. Key macro indicators continued to surprise to the downside but inflation expectations remain in an upwardly skewed trend. 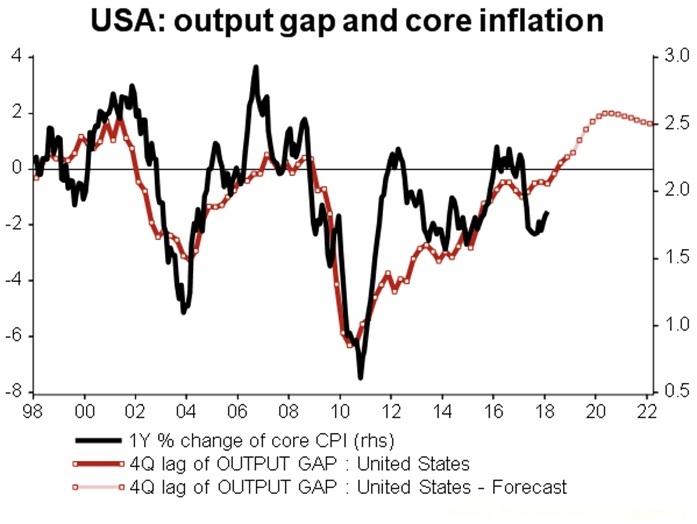 This week, US core inflation should increase slightly and the Fed will release the March minutes, possibly highlighting its view on the general economic situation and financial stability considerations. Last week, equity performance resulted mixed after major indices tested a technical support and after US put/call volatility spiked up, testifying a short term surge in risk aversion. The MSCI World index’s total return fell by 0.6% (S&P 500 -1.4%) but the EMU index overperformed at +1.1%. US high yield spreads declined by 15 bps and 10-year rates in the US increased by 4 bps to 2.78%, while the 10-year German Bund was flat at 0.50%. Italian BTP-Bund spread was also unchanged at 129 bps. 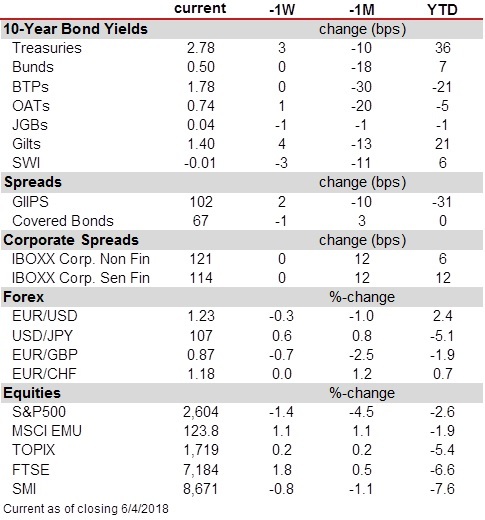 Macro data continued to show negative surprises versus expectations. In the end this represents a signal of an economic deceleration, albeit from quite high levels. At the same time, inflation data and inflation expectations remain firm, with a trend which is skewed on the upside. Overall the growth/inflation mix remains good but it is deteriorating: confidence indicators are clearly toppish but recovering price pressures will make central banks become more assertive on policy normalization. For example last week, ISM and PMIs indices decelerated but the price paid component of the US ISM manufacturing index increased sensibly. In March, nonfarm payrolls increased by just 103k, much below expectations. However, this was mostly due to volatility in construction and retail trade. The unemployment rate stood at a 17-year low of 4.1%. Hourly earnings were up by 2.7% yoy, as expected. The steady progress in wages fits with the Fed’s outlook, and the temporary weakness in employment figure should not change its assessment. In Germany, industrial production data were weak too. Higher equity volatility, increased trade frictions and prolonged strikes in France, could eventually hurt firms’ production intensions more broadly in the euro area in the next months. In Italy too, weaker confidence and auto sales added to the negative momentum. On trade, last week, the US representative released its list of products that could be subject to tariffs, planning to impose 25% tariffs on 1,333 products from China (roughly $50 billion in goods imports). China threatened to raise tariffs on an equal value of US goods exports. Later on Thursday, President Trump floated the idea of applying sanction to additional US$ 100 bn worth of imported goods. However, discussion between Chinese and US officials are underway. 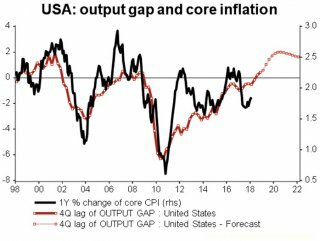 Looking into this week, US core inflation should increase slightly, mostly due to a base effect. The Fed will release the March minutes, possibly highlighting its view on the general economic situation (labor market etc.) and financial stability considerations, including counter-cyclical capital buffer for banks.